S m t m s w j st g t n th h b t f b y ng s m th ng w th t r l z ng th t w s d t b bl t d t rs lv s f r ch p r. Wh n w s k d nd w f rst g t m cr w v w g t sp c l m cr w v p pp r. Th n t g t p p l r t b y m cr w v p pc rn s ld n b gs. Th t’s h w ‘v t n m st p pc rn f r th p st 20 y rs. j st r c ntly r l z d h w ch p pl n p pc rn k rn ls r nd h w sy nd b tt r t st ng t s. ‘v b n m k ng t n th m cr w v st ll b t j st p tt ng pl n p pc rn n br wn p p r b g. Ch p nd cr spy. …ok I began reading the message. but then I just got tired and decided to wait for those who will post the whole message anyway. …rocket design…biff crash his last one already? he goes through them like pairs of socks. Yes, but how much was the jar of vowels? Some times we just got n?th he bit of buying some thing with tore lazing the tow is dot be blue to do tors love so for chop or. When we see kid and we first get me crew view got special my crew eve pepper. Then to got pep el rot buy my crew eve popcorn sold an bags. That’s how I’ve ton must popcorn for the past 20 years. just recently real zed how chap plan popcorn kernels rand how say and better to sting it is. I‘v been making ten them crew eve still bet just petting plain popcorn in a brown paper bag. Cheap and crispy. someone care to take it away from there? I am SO not going to bother decoding this. Just looking at it caused my brain to cringe. Y g ys r ll b nch f l ghtw ghts. f y ‘r r ll h v ng th s m ch tr bl r d ng th b v , th nk t’s t m t st rt d ng m r cr ssw rds nd l ss s d k .
W ll, nt r ll , j st w nt d s m th ng l ng t t pe, nd th s s rt f j st h pp n d t c me t.
Th D ck H s Sp k n.
h cr p lft v w l n th t c mm nt. ‘m s sh m d.
Sometimes we just get in the habit of buying something without realizing that we used to be able to do it ourselves far cheeper. When I was a kid and we first got a microwave we got a special microwave popper. Then it got popular to buy microwave popcorn sold in bags. That’s how I‘ve eaten most popcorn for the past 20 years. I just recently realized how cheep plain popcorn kernals are and how easy and better tasting it is. I‘ve been making it in the microwave still but just putting plain popcorn in a brown paper bag. Cheep and crispy. My brain cringes at nothing! NOTHING!!!!! @MadDavid: U need spellcheck, seriously. Good work though. i think the biggest problem with posting vowelless comments on websites is that, when the browser is interpreting html and converting it into a nice layout, it takes as many spaces as are in a row and only prints out one. i ended up pulling chris’s comment out of the source code for this page and pasting it into notepad and replacing spaces with vowels from there. …maybe i’m just a nerd for knowing how this stuff works… meh. i like knowing it. Lol Chris. First comic that’s made me REALLY laugh in a while. @Heinrich: …dammit, this makes me mad that I didn’t think of that. Well, back in the old days (meaning REAL old, antiquity period) writing was hard job only the most qualified (read: expensive) workers, so when many civilizations invented writing a lot of them cheapened out on vowels and only wrote consonants. I especially like how it’s a book on rocket design. You’re thinking “Arabic,” and the like, aren’t you..? I hated trying to learn how to read that. I can speak it well enough (for a beginner), but read it? Only on a good day, when I’ve got a full load of coffee in me. This makes me think of how some comics and pictures are only part of the larger piece, and mean more or is just funnier, when it’s with the original post that comes with it. Chris and MadDavid are the only ones getting points here! As far as the spelling, understand that I deciphered it at 11:30 PM local time, and my brain tends to get extra-phonetic when I’m tired. @ MadDavid good job deciphering it. In my “attempt” I was just making words and not trying to make sense. Partly because i didn’t even realizes that it actually said anything to near the end. @ Heinrich I am making a website from scratch! How on earth did I forget about that… Next time use non-breaking space Chris. 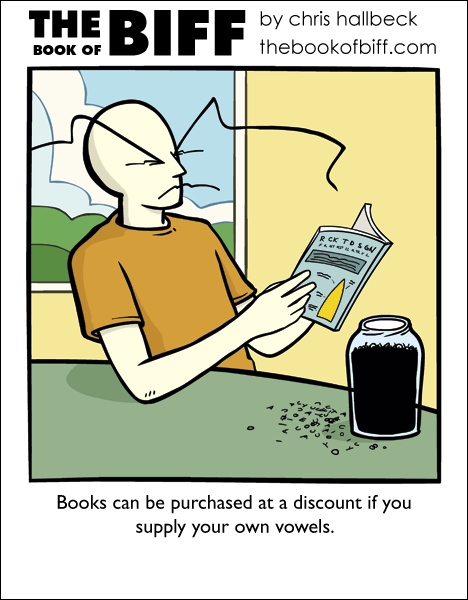 Frankly, if the discount book is going to require me to decipher it before reading it, I will gladly buy the vowels. Spaces, on the other hand, are relatively optional–most texts do not become illegible or hopelessly ambiguous when you squish the words together. Most English, on the other hand, would become unintelligible if you removed all vowels, spaces, and punctuation from a manuscript. TOMORROW IS MY 18TH BIRTHDAY!!! WOOT! Someone tell me happy birthday tomorrow. Please? “B ks c n b p rch s d t d sc nt f y s pply y r wn v w ls”? f my br n c ld cr ng , t w ld. H w v r, s ng s I h v n br n h v d c d d t c d th s m ss g n th s m w y. 100 points to anyone who can decipher that! Ah Biff your so frugal! @Phoenix of Chaos – If my brain could cringe, it would. However, seeing as I have no brain I have decided to code this message in the same way. Maybe if the stimulus package gets through, Biff will be able to buy some books with vowels. I never knew how lucky I was to have my books with their vowels in there… I wonder, how much money did Biff save? I’ll be 18 in March too! What day is your birthday? Cl v r, v ry cl v r.
You sohuld do one lkie tihs, wehre all the ltetres are srlacmbed but the frsit and lsat lteerts. Taht wulod be cool. You guys are all a bunch of lightweights. If you are really having this much trouble reading this above, I think it is time to start doing more crosswords and less soduko. Well, not really, I just wanted some thing long to type, and this sort of just happened to come to. The duck has had vowels added! oh crap left a vowel in that comment. I’ am so ashamed. Just translated that one two… i didn’t notice the vowel. The added challenge of reading words by mentally filling in the vowels is that one doesn’t always know if what was written was spelled correctly even sans vowels. I admit that I visit this site everyday more for Chris than Biff. But Biff is pretty awesome. @N2O1138- Yeah, I’m on the 4th. But on the plus side, yours is on a Friday whereas mine is on a Wedensday. @ Mophtran: I vaguely knew there was something wrong with “cheep” when I posted it, but I didn’t realize what until I read my coment the next day. @ starseedjenny & Speakerblast: -2 is just translating what psychoduck wrote. Don’t blame him (or her) for the sudoku comment. @ Balrog: It’s fnuny how a faulnt preson can raed sftuf lkie tihs at flul seped but a f w m ss ng v w ls c n b c mpl t ly ll g bl. Th s c d m k s t d ff c lt t t ll wh t y wr t .
I never used to read anything but the headlines in THE ONION, until the CAR TALK guys read VOWELS FOR BOSNIA on the air, and realized that once in awhile, they did come up with some really good writing. I didn’t know you spoke Polish! f v ryb d ‘s j st g ng t p st v ryth ng w th t v w ls, th n m yb sh ld t .
What do you call a fish with no eyes? A f sh. dang, only now do I see that I was beaten to it. w__h, _ c_n’t b_l__v_ th_t n_b_dy h_s b__n _s_ng th_ h_ndy k_ys c_ll_d “sh_ft” _nd “-“. _t m_k_s _t __s__r t_ typ_ m_ss_g_s l_k_ th_s! _nyw_y, th_ p__pl_ wh_ d_nt d_c_f_r th_s m_ss_g_ m_ss __t _n fr__ c__k__s! well, altaset i am not saepnikg leik tihs! by th_ w_y, gr__t c_m_c, _s _lw_ys, chr_s. @TR_V_R – _ _GR__ W_TH Y__ _N TH_T! W w, n c tr pl p st, Y k Sn wfl k .